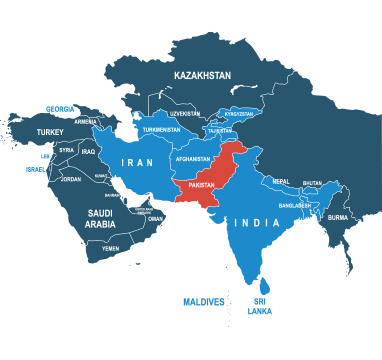 Trusted by millions of senders across the world, we have extensive experience in international courier delivery and can get your parcel to Pakistan affordably, and with the high service levels you would expect. A country that is as diverse as it is beautiful, Pakistan is home to some of the world’s highest mountains such as K2 and Nanga Parbat, as well at the Katpana Desert - the world’s highest cold desert. Helping you get your parcel to Pakistan whether you’re looking for a parcel courier to Islamabad, Karachi or somewhere more off the beaten track; at DPD Local Online we can send a parcel wherever you need it to go with the minimum of fuss. Calculating how much shipping to Pakistan will cost is easy with our express and economy courier delivery at your fingertips. Just fill in our straightforward online form and we’ll give you an instant quote; you can rely on DPD Local Online to make the process as easy as possible. For a service you can trust, book your shipping to Pakistan with DPD Local Online today. Do I need to deal with customs when sending from the UK to Pakistan? Since Pakistan is outside of the EU, you’ll need to be ready to deal with customs duties and import taxes when posting to Pakistan from the UK. Don’t worry, though: when you book with DPDLocal-Online, we’ll send you all the documents you need to make sure your package gets through customs with minimal fuss. Easy! How much does it cost to send a parcel from the UK to Pakistan? Postage to Pakistan costs as little as £27.30 when you book through DPDLocal-Online. What’s even better is that it’s only £1.21 extra to get express delivery! No one else works harder to get you the best deals on international deliveries. How should I address my parcel for delivery to Pakistan? The addressing system in Pakistan is practically the same as it is here in the UK, with the exception of a numeric ZIP code rather than a post code, which is placed on the penultimate line of the address alongside the sector number (sectors operate similarly to counties). Check out this useful guide to addressing a parcel to Pakistan put together by the Universal Postal Union. Toys, games, and sports requisites. You can find out more about items banned in Pakistan’s post by consulting with HM Revenue and Customs. And for a rundown of all items that are commonly restricted in the post in the UK see our prohibited items list.